Remove the decals from the postal tube and allow them to 'un curl'. 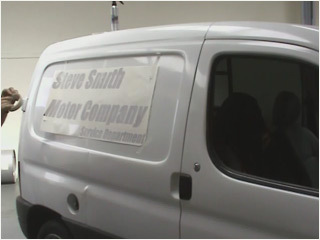 After the surface has been thoroughly cleaned, offer the graphic to the surface of the vehicle and hold in place with masking tape, ensuring the decal is correctly lined up. 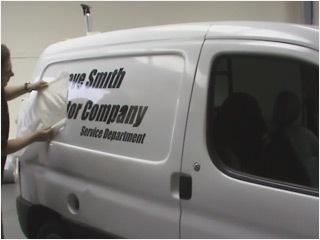 Remove half of the backing paper and spray a generous amount of water onto the sticker and the surface of the vehicle. 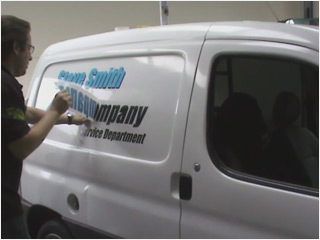 Using firm pressure, smooth the decals down with a squeegee, squeezing as much water out from behind the graphic as is possible. Repeat the above process for the remaining half of the graphic. Once as much water as possible has been squeezeed out from behind the graphics, allow the remainder to dry. You can use a heat gun on its lowest setting to help speed up the process. 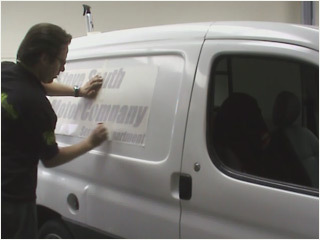 Peel back the applicator tape slowly, at a sharp angle, ensuring the lettering remains stuck in place. 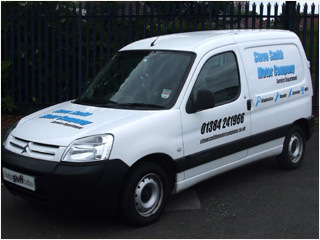 With this particular van, a 3D effect has been acheived by overlaying a contrasting coloured graphic, using the same technique as above. Step 10. Stand back and admire! 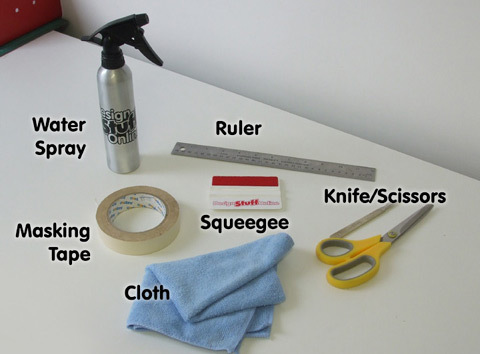 A water spray, ruler/measuring tape, masking tape, squeegee (a credit card with a peice of cloth wrapped around makes a good substitute), a cloth and a sharp knife. Step 8. Stand back and admire! Stand back and admire your handy work. If any air or water bubbles remain, these can be removed by lancing the vinyl with a pin or point of a knife.